Lynette & I have started a road trip to say our farewells to our family and friends before casting off. Sitting with her parents and sharing all of the preparation we've made to go out. We realized this is a very old dream, with many years in the barrel, aging. We feel it is important to state that we are not like many Youtuber's who make themselves famous for being foolhardy with statements like "I only had a 10 hour of a sailing course, now I'm sailing around the world alone from France" and other such drivel. The more time you spend at sea, the more humble you get. When I was a teenager, I stepped out of the water into a 420 class sailboat a friend of mine had, he trimmed the main and off we went, lowered the centerboard once we got into deep enough water and sailed. I was mesmerized --hooked. How can this boat hold our weight? How are we moving with just the wind? How far could we go, all the way to Bainbridge Island? Could we go beyond? I started building crude model boats with shaved styrofoam, then started reading design books like The Proper Yacht, I pored over them and read about what made them better or worse. 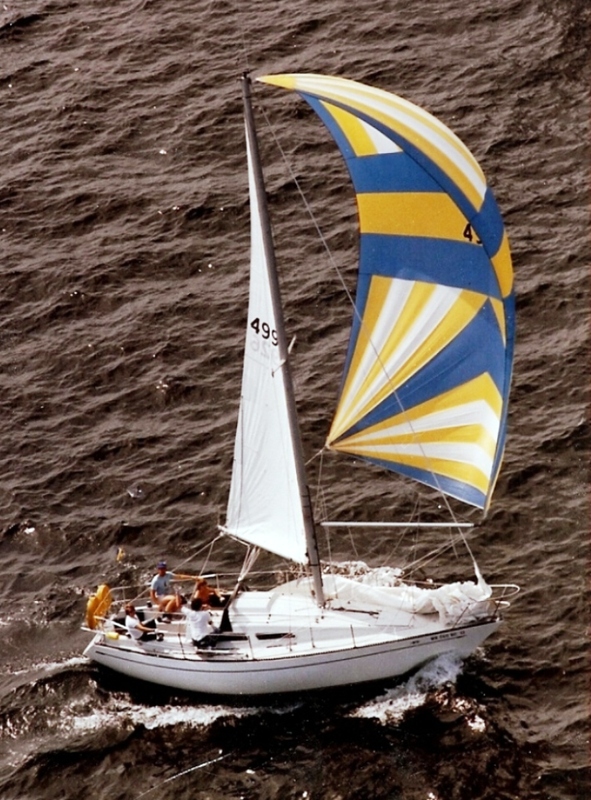 Then our family got a 27 foot sailboat, it slept 5 and we started sailing on weekends and vacations. Then I got an old El Toro that was dry rotted, leaked and was held together with Woolsey's paint and Life-caulk. I had to bail all the time, but it was my boat, her name was Ripples. I would always get into trouble for going out too far, beyond the 'boundary' (the line wasn't very clear in my memory) My dad made me take the USCG Boating Skills and Seamanship course and was the youngest person in the yacht club to pass it when I was probably 14 yrs old. I would get to race with anyone who would take me, I was a sailor! I would walk the docks or have my dad work the yacht club for opportunities. Johnny Bleck, a real old salt, who would win races single-handed on a Rawson 30, took me under his wing. It was like the Karate Kid. He'd let me sail with him if I would crawl into the bilge and caulk some crazy thing that was leaking. We rebedded stanchions, adjusted compression fittings and cleaned all parts of his boat, sanded teak and yes, waxed on-waxed off. I spent about 4 years of my life in the water, on the water and in a generally mild state of hypothermia. I raced extensively with one of the best sailors in the Northwest, Dan Wierman on his boat "Good News". We did Swiftsure, the Grand Prix and many other major races in the Sound. One year our family was caught in a storm on our way to the San Juans. It was a fresh gale of 35 knots, gusting to 50, a wave broke and swamped our dinghy, tore it off the back of the boat, when we tried to go back for it, we could not get into the wind to save our little boat and lost it. We found refuge in Pt Hudson harbor in Port Townsend, what a feeling of surviving a storm. I decided to go exploring the area. I could hear the howling wind in the rigging of the boats safely moored in the harbor, I could smell the anise that grew wild and I caught a glimpse of a wooden hull being restored in a long white building. I stepped in, it was empty, barn swallows flew in and out of the loading dock door. It was magical, smelling the freshly cut teak, seeing the rear bustle of the boat being replanked, "wow what a sweet shape". I thought to myself, at 15, "how can I make a living being part of this community, to sail any day I wanted to?" I went up stairs to the sail loft, the now famous Carol Hasse sailmaker was there and I posed the question to her. This was 1980. She said something like, "You don't want to get into sailmaking, you'll be broke, I live on a 26 ft Folkboat with a friend where you can't stand up." So I decided to start researching a way to make a good living, I discovered Robert H Perry, who at the time just hit a home run with the Valiant 40 design. That was a cool job, to be a Naval Architect! I started to study all of the details, designs and methods of building yachts; I started drawing boats. I over-built a drafting table in wood shop, I had this huge thing in my room. I took a boat building class in high school (who has that?) I was so very fortunate to live on the water, surrounded with the natural beauty of Western WA and the boating community. When I turned 16, like any other red-blooded American male, I loved muscle cars and in particular, 65 Mustang's. I helped a friend rebuild one over the summer, so naturally when it was my turn to get my license, I bought a boat, wait, what? I got a Lido 14 and my life was now even more concentrated on sailing. I raced and sailed every time the wind blew. I would later sell that boat to buy my first car when I was 18, a 1964 1/2 Mustang with a 260 ci engine and a 3-speed transmission. It was a very rare car I bought it for $1,900 however it was wasted on my youth, I did not realize what I had till many years later. One day in my drafting class I showed my instructor a boat I 'designed', he said, "Looks nice, will it float?" I said, "Of course it would, it's a boat, right?" Little did I know, this particular teacher Steven Smith, built a 40 foot steel cutter that he had sailed all over the world and lived on with his family, he knew a few things for sure. So he handed me two books, about the math and engineering of yacht design. Skene's Elements of Yacht Design was a significant book for me, I still have it and it has been consumed over the years. My senior year project was a complete design set of drawings, pen and ink on vellum and mylar, all the offsets and hydrostatics. In 1983, after graduating, my design was published in Nor'Westin magazine and received a nice review, I was 18 and published. Little did I know, most people wanted experienced architects to do their work and it took years before any of my designs were built or that I'd get paid to do it. That is Good News, I recently came across this picture from the 1983 Swiftsure in Victoria BC on Bob Perry's web site. That is me in the hatch with no shirt. What's good about the girl was she was the right girl. So many of these stories end with "so that was the last time I went sailing" or similar. She was not a sailor, yet, but my Dad said to her once we were engaged, "if you want to marry my son, you need to know that sailing is a big part of his life and if you don't like it, you're not the right one for him." So she went out with my sister and Mom & Dad for an evening sail and loved it. On our honeymoon my parents let me take that boat for a few days to Edmonds & Pt Townsend. That was a very special time. We had other second honeymoons on that boat.